Since withdrawing from the Trans-Pacific Partnership on his first working day in office, and formally opening the North American Free Trade Agreement to the renegotiation process, President Trump’s rhetoric on trade has perhaps caused more anxiety among agricultural producers than actual executive branch action. However, implementation of concrete trade policy from the Administration began to emerge in January of this year when the U.S. slapped tariffs on imports of solar panels and washing machines. At the time, Bloomberg News reported, “China is the biggest maker of solar panels and expressed displeasure at the move.” Then, in February, China launched a probe into U.S. sorghum imports. The next day, The Wall Street Journal reported, “China fired a retaliatory shot against the U.S., announcing planned tariffs against American goods and saying it is readying more actions against the Trump administration’s proposed penalties on Chinese exports.” The Journal article noted that the measures being considered were items such as fruit and pork, but not soybeans or sorghum, and added that the potential penalties were in response to U.S. tariffs on steel and aluminum. On Tuesday, New York Times writer Ana Swanson reported that, “The Trump administration said Tuesday that it will place a 25 percent tariff on Chinese products like flat-screen televisions, medical devices, aircraft parts and batteries, outlining more than 1,300 imported goods that will soon face levies as part of a sweeping trade measure aimed at penalizing China for its trade practices. Lingling Wei and Yoko Kubota reported on Wednesday at The Wall Street Journal Online that, “China stepped up its trade fight with the U.S., retaliating against proposed tariffs on Chinese goods by targeting high-value American exports, from airplanes to soybeans, in a tactic Beijing officials say is meant to secure a truce. Moving with unusual speed, Chinese officials outlined plans to make it more costly to import 106 types of American goods into China. They are intended to hit the United States square in the farm belt — a major section of President Trump’s political support but also a major supplier of what China stocks in its supermarkets. 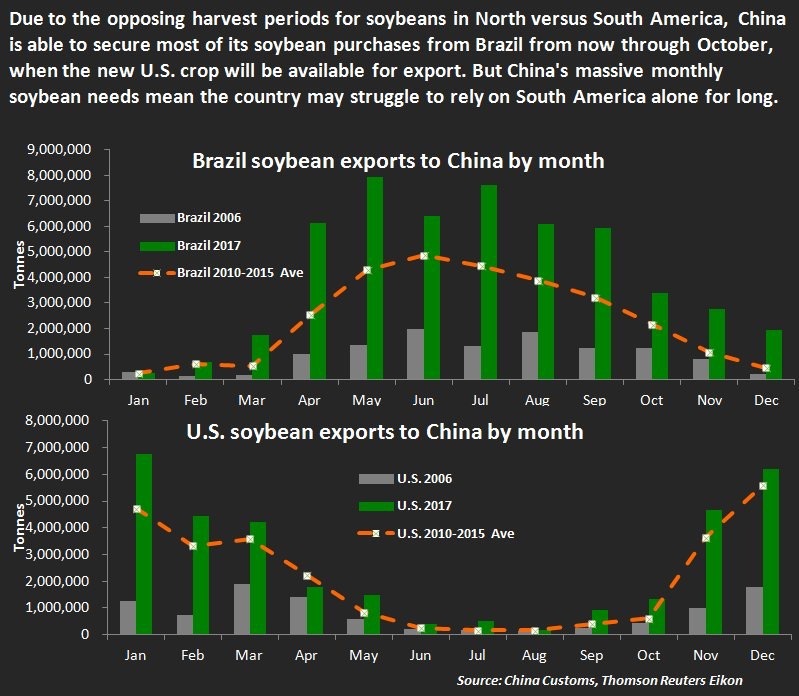 More broadly, Bloomberg writers Alfred Cang and Phoebe Sedgman reported on Wednesday that, “China has taken aim at America’s rural heartland as the top buyer of U.S. soybeans said it would restrict imports. “American Farm Groups Plead With Trump to Back Off China Trade Conflict,” by Alan Bjerga. Bloomberg News (April 4, 2018). 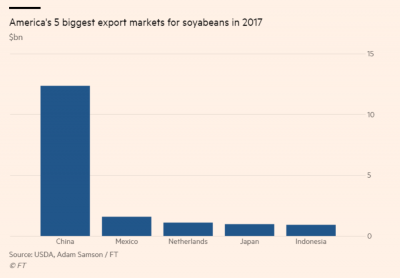 “Tariffs would deal ‘devastating’ blow to US soyabean farmers — trade group,” by Adam Samson. The Financial Times Online (April 4, 2018). The FT article stated, “China’s planned retaliatory tariffs, which were unveiled in response to measures by the Trump administration, ‘will have a devastating effect on every soyabean farmer in America,’ said John Heisdorffer, president of the American Soybean Association, which represents more than 300,000 soyabean producers. Tariffs on pork and soybeans in China will hurt IL farmers. I support fair trade and fighting for American manufacturing, but I expect this Admin. to fight as hard to protect markets for our farmers. Yet again, the heartland is feeling the consequences of a reckless president. Jacob Bunge and Jesse Newman reported on Wednesday at The Wall Street Journal Online that, “Chinese officials didn’t say when the country’s proposed 25% tariffs on soybeans, corn, wheat, beef, and other products would take effect. But in central Illinois, Aaron Wernz is already considering how to react. 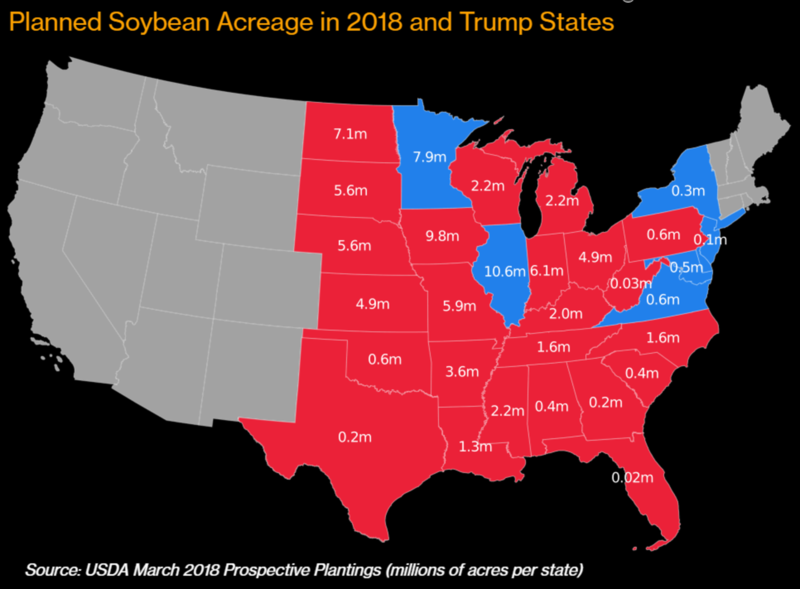 On Wednesday he said the sharp drop in soybean prices and the possibility of diminished sales to China could prompt him to sow more corn, and less soybeans, on his 2,000 acres when he fires up his planter in a few weeks. He said he would also take a harder look at future seed and fertilizer purchases if crop prices remain depressed. The proposed retaliation from China will have a negative impact on the state of Nebraska. @POTUS must negotiate with the Chinese in a constructive way to get good trade results for our farmers and ranchers. And, Reuters writers Mark Weinraub and Michael Hirtzer reported on Wednesday that, “China’s swift retaliation rattled U.S. farmers, their options shrunk by the wide variety of agriculture products that have been or could be targeted by China. Doug Keesling of Kansas struggled to imagine what crops he might plant instead of soy. 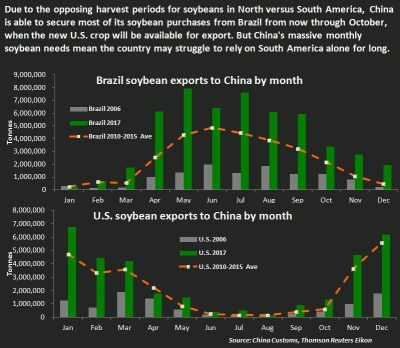 “China tariffs on soy, sorghum spread fear in U.S. farm country,” by Mark Weinraub and Michael Hirtzer. Reuters News (April 4, 2018). “Officials Mulling Possible Help for #Farmers as U.S./#China Trade Tensions Rise,” https://goo.gl/iHeU5L (MP3- 1 minute). @USDA Radio. Meanwhile, Tamar Hallerman reported earlier this week at the Atlanta Journal Constitution Online that, “Agriculture Secretary Sonny Perdue said Tuesday he feels confident that President Donald Trump will not allow farmers ‘to bear the brunt’ of a possible trade war with China.